4-pin miniDIN female to female gender changer. 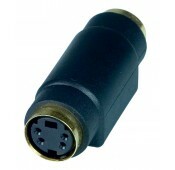 Convert male 4-pin miniDIN connector to female. Join two male S-Video cables together to extend cable length up to 100 feet.